Here you will find our top choices of universal fit ear plugs that are sold specifically for swimming and keeping water out of the ear. This category also includes surfing ear plugs which are made to keep water out of the ear while still letting you hear well with the ear plugs in place. Surfing ear plugs work just fine for swimming, but swimming ear plugs may not let you hear well enough when surfing. Mack's AquaBlock swimming earplugs are a very good inexpensive reusable ear plug for swimming. Soft, triple-flange design creates a comfortable and effective seal against water. One pair with free carry case. Mack's AquaBlock swimming earplugs are a very good inexpensive reusable ear plug for swimming. Soft, triple-flange design creates a comfortable and effective seal against water. Two pairs per pack. Free carry case included. (NRR 27) Hearos Multi-Use Reusable Water and Noise Protection Ear Plugs are ideal for sealing water out for swimming and water protection. The NRR 27 also makes Hearos Multi-Use ear plugs an excellent choice for noise environments up to 112 dB, including shooting sports, home shop and industrial workplace noise protection. (NRR 20) Cirrus EarGuards are both a swim and noise plug. The ceramx filter lets you hear, reducing noise for greater comfort. Seals out water for swimming. One Size fits most adults and children of 5 and up. (NRR 27) Mack's Ear Seals multipurpose reusable earplugs are made of soft, pre-molded silicone rubber with four flanges for great sealing against water and sound. Ear Seals are sturdy, for long lasting performance. (NRR 24) These ear plugs provide an excellent seal to keep water out and keep your ears dry. With two pairs of plugs and the convenient FREE carry case included, AqualSeal® ear plugs are easy to keep with you at the pool or beach, and equally easy to keep clean between uses. (NRR 23) When pre-molded rubber and silicone ear plugs won't do the trick, HearRight Swim Soft GelFoam™ ear plugs are ready to help. These super soft foam ear plugs feature a waterproof outer seal, making them great for swimming, bathing, and splashing around at the pool. Cirrus ClearEars are the first earplugs designed to draw water from your ears. The fast, safe and effective alternative to ear drops. 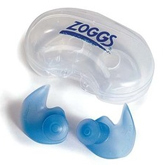 Zoggs® Aqua-Plugz™ Ergonomic Surfing and Swimming Ear Plugs are shaped to fit comfortably, but securely into the outer ear, sealing the canal against water entry during surfing, swimming and bathing, while still letting you hear what is going on around you. (NRR 8) Alpine SwimSafe Swimming Ear Plugs feature a special built-in acoustic filter with a very small opening that prevents water from enter the ear while allowing ambient sound to remain fully audible. Alpine Pluggies for Surfing, Swimming, Flying, Concentration and Noise Protection are a terrific solution for water babies of any age, especially when you need a water protection or flying ear plug and still want to be able to hear what is going on. With two different sizes of plug tips you can get the snug fit and complete seal against water you need. Crescendo Swim also offers the ability to hear what's going on around you without the need to remove the plugs, which is a critical safety feature. High quality reusable swimming ear plugs. Discount pricing is available for orders of 10 or more pairs. Please email info@earplugstore.com for pricing. (SNR 20) NoNoise Water Sports Ear Plugs are ideal for a wide variety of water sports and swimming activities. They feature a triple-flange seal and hypoallergenic silicone free thermoplastic material for a comfortable fit that won't give out during jet skiing or surface swimming. SEKI Ear Plugs for Surfing keep you protected from water and cold wind, helping to prevent surfer's ear. SEKI features a super thin membrane that keeps wind and water out, while allowing sound to pass through clearly so you can hear what's going on around you. Designed by surfers for surfers. Alpine SurfSafe is designed for surfers and other water sports enthusiasts, to help protect from surfer's ear (exostosis). Keeping cold water and wind out of your ears is incredibly important. SurfSafe does the job, and also lets you hear what's going on around you, keeping you safer while you surf. SurfEars are designed to stand up to anything you can dish out, with support wings to ensure these ear plugs will hold up and keep water out even through the most epic wipeouts. An acoustic mesh layer keeps ears safe from water, spray, cold air, dirt, and bacteria. For surfing, you need Surfear. SwimEars keep out cold water and wind, keeping your ears safe while you swim. Special acoustic filters let sound through clearly, preserving your hearing and your sense of balance. Helps prevent swimmer's ear and surfer's ear.